Built in 2008, the Jade Emu International Guest House is run by Dave (from Australia) and his partner Song (from China). It caters for the 'budget conscious' traveller looking for rooms and facilities of a more international class. Double, twin/triple share and dorm rooms available - all are modern, clean and comfortable. 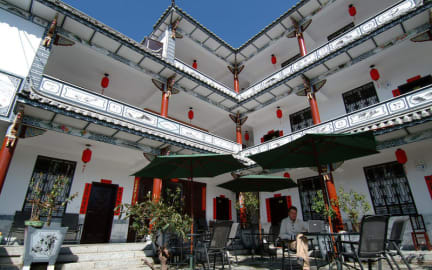 Staying here, you'll be relaxed and ready to explore the ancient and natural wonders in this beautiful area of China. Located just 1 minute from the West wall of Dali Old Town and 5 minutes walk to the centre of town, the Jade Emu International Guest House is conveniently located. - Bar with a wide selection of beers, wine and spirits. - Kettles, towels, soap and shampoo provided in all rooms. Absolutely fantastic hostel! The owners, management team and all staff are incredibly helpful and welcoming. A lovely dog named magic runs around who is an absolute delight to watch! Food service tastes great (especially the beef burger) and they offer snacks, daily activities and provide tonnes of support for your time in Dali. The beds are very comfortable with heated blankets in case you get cold. Rented both a dorm room and a private room at Jade Emu—both were fantastic. Very clean facilities, helpful staff, good food at the restaurant. Also a very nice atmosphere for meeting people with a good location for seeing all of the sites in the old town. Definitely rent a scooter somewhere in the old town to see the lake and other nature sites. Highly recommend! Second time I've stayed here, been great both times. Awesome location and super helpful staff. 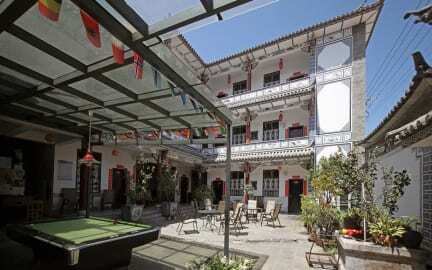 The hostel is quite a good location situated near the old city but not inside which is too crowded. The receptionist was good in giving info. The food and the atmosphere was nice. They clean the room everyday. Really lively hostel with a great atmosphere. Easy to meet new people. Location was a big plus, very close to old town and the bus stop. Had a really nice time staying here, but it wasn't without it's downsides. We stayed in a 4 bedroom dorm and the bunks has a serious squeak problem. Every time you turned over at night there was a nice big groan from the bunk below. I think this was actually caused by the metal lock boxes attached to the bunch (which were great btw). Our room wasn't very clean when we arrived, but I think that might have just been the quests that were there. Food was really good, try the mushroom claypot. Overall we had a wonderful stay. Some issues such as lack of hot water and clogged toilets came up. The staff were attentive and responsive to concerns. The common area was very friendly and we even participated in the Christmas party. Nice hostel opposite old town, nestled in an area with several other hostels. I stayed in the newer dorms (ensuite), which were nice with plenty of space, electric blankets, outlet/light on each bunk, etc. Note: they are across the alley from the main building. As it was the off-season the hostel was fairly quiet, but food was decent and people hung out in the common area. Good location, short walk to old town and close to bus stop for the train station, lake/villages, and 3 Pagodas.